Check them out on the Gift Baskets page. NEW Build Your Own gift baskets. Contact SeaWolfe Tackle for more info. Would you like a PDF or CD version of our catalog? Just visit our Contact Us page and fill in the form. In the comments section, ask for the catalog in the prefered version! It's that easy. 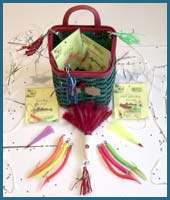 We would love to hear from you and to show off your catch on our web site. Click on the Merrick Tackle below for more info.